It is a common task to split a PDF document that contains multiple invoices (or similar documents) into separate files. 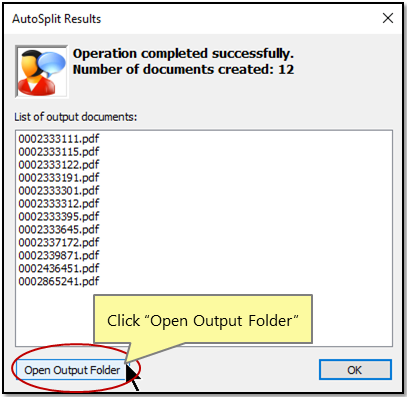 The AutoSplit™ software can split PDF documents that contain variable-length invoices, account statements, and reports into separate PDF files. 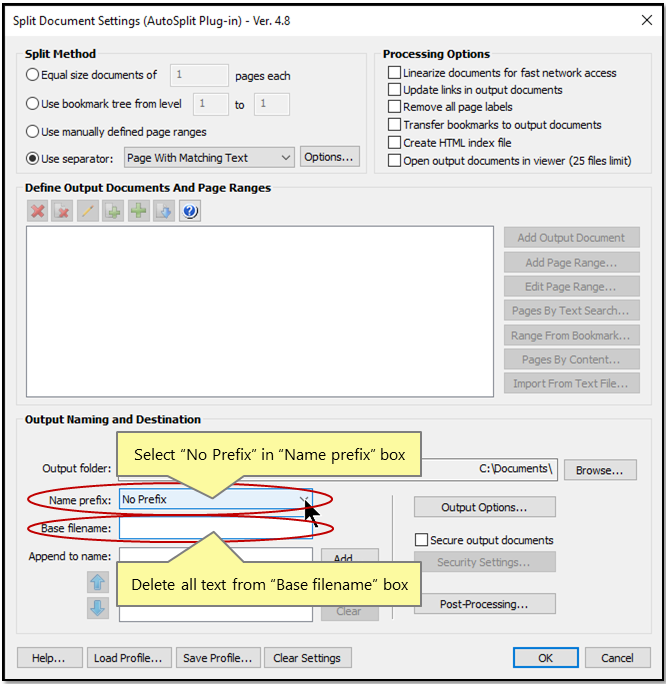 The following tutorial shows how to split a PDF file that contains multiple invoices. Each output PDF file will contain only a single invoice and will be named using the corresponding invoice number. The input PDF document contains multiple invoices of variable length. The goal is to split it into multiple documents that contain each invoice as a separate file and name it, using invoice numbers from the first page of each document for file names. It is common that each invoice has its separate page numbering, typically in a form of "Page N of M" text pattern. 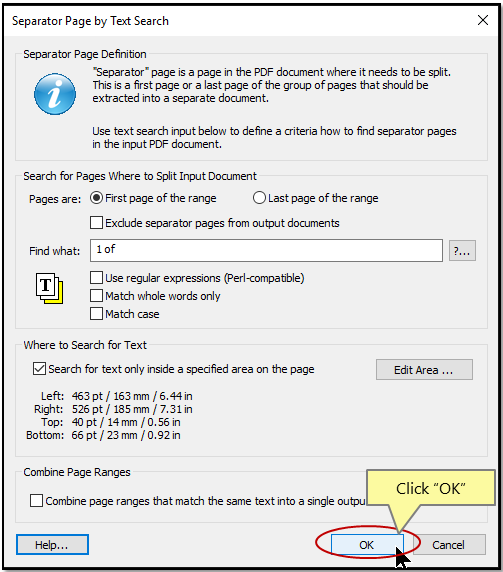 The easiest method to split such documents into separate files is to use "Page 1 of " or “1 of N” text as a separator. Since this text always occurs on the first page of each invoice, it is natural to use it as a reliable separator. 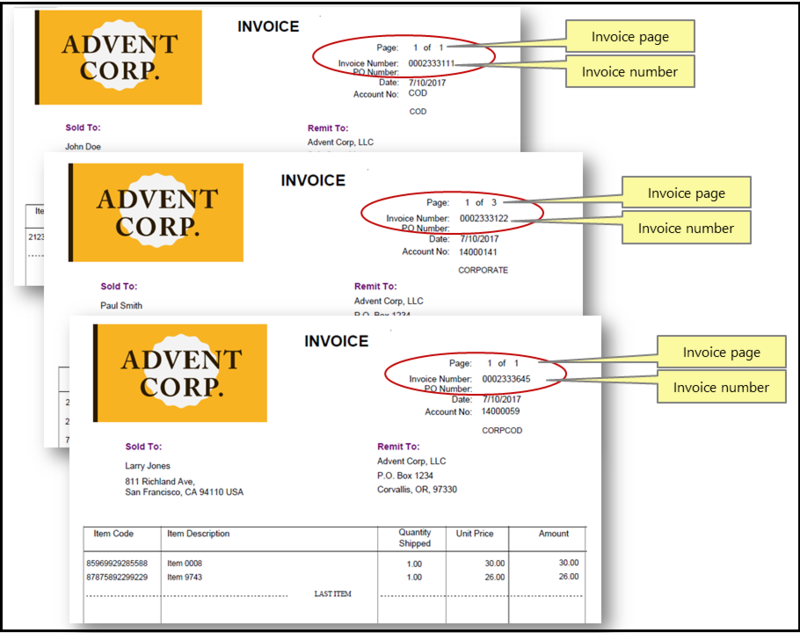 Using “Page 1 of” is the very common method for splitting invoices or statements. You need a copy of Adobe Acrobat Standard or Professional along with AutoSplit Pro plug-in installed on your computer in order to use this tutorial. You can download trial versions of both Adobe Acrobat and AutoSplit Pro. 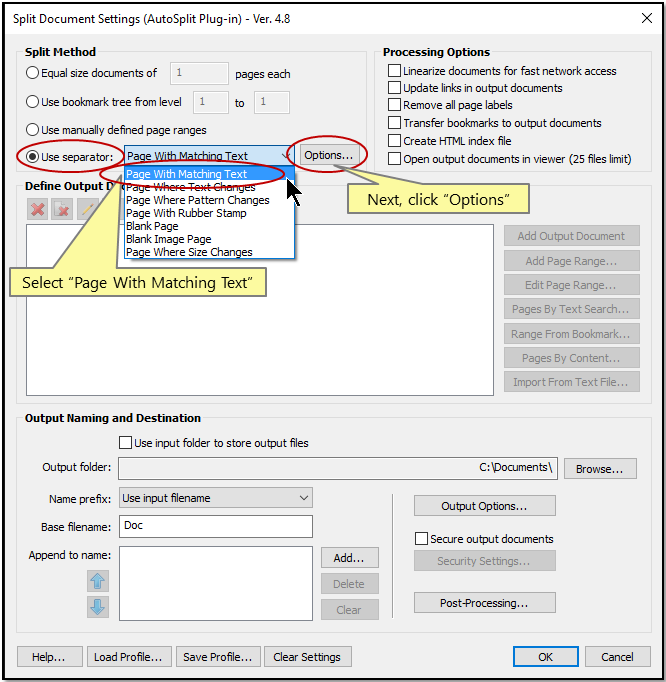 Start Adobe® Acrobat® application and open a PDF file using “File > Open…” menu. Check “Use separator” box, select “Page With Matching Text” from the list of available options. Enter “1 of” into “Find what” box. The document will be split at pages that contain “1 of …” text. This is a common way to detect a first page of each invoice since it often contains "Page 1 of N" labels. 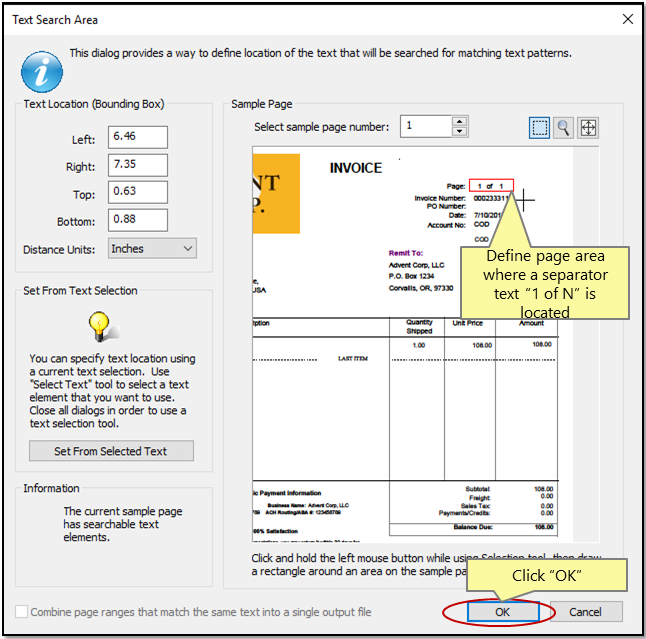 Check “Search for text only inside a specified area on the page” box to limit text search to a specific area. Press “Edit Area…” button to define an area on the page where to look for the text. 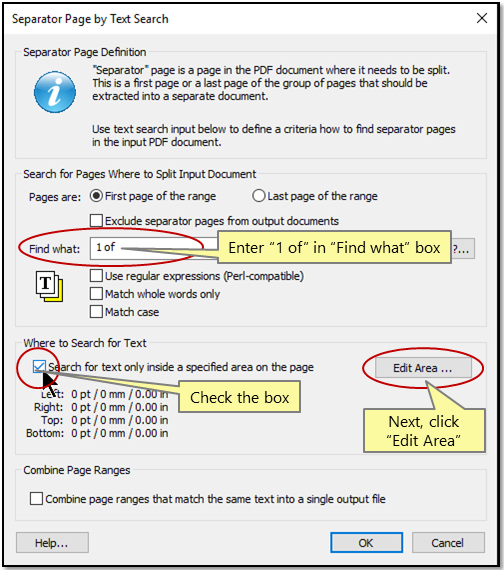 Define page area where a separator text (“1 of N”) is located by drawing a box around it. Try to select an area that does not include any other text. Use "Zoom" tool to enlarge part of the page for a more precise selection. Press “OK” button in the “Separator Page by Text Search” dialog. Set "Name prefix:" to "No Prefix" option. Make sure "Base filename" box is empty and there are no any entries in "Append to name:" list. 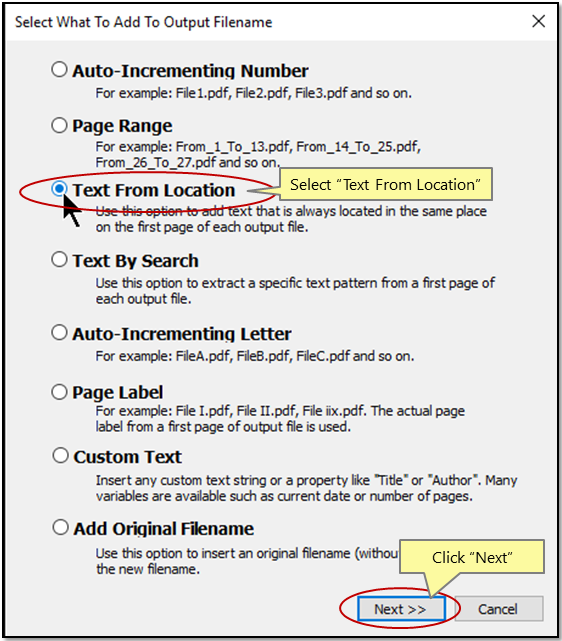 Press “Add…” button to define how to name output PDF files. The output file name can be assembled from multiple components. 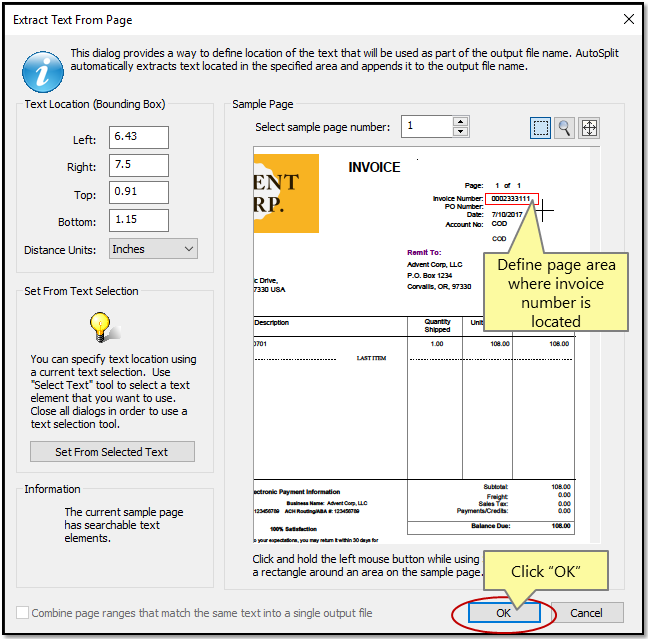 One of the options is to extract text from a specific page location. The text for the filename will be extracted from the first page of each output PDF document. Select "Text From Location" option and press "Next" button. Position mouse at the page area where you want to extract text for the filename (where invoice number is located) and press and hold left mouse button. Draw a box around the area and release mouse button. Now you have defined the area for thtext extraction. If you made a mistake simply do it again. Press “OK” button once done. Click ‘OK” button to proceed. The “Results” dialog will list output files that were created during the processing. Each invoice is now saved as a separate PDF file and named by the corresponding invoice number.